Real Madrid forward Cristiano Ronaldo says the players have a better relationship with new coach Zinedine Zidane than predecessor Rafael Benitez. Real have won both games - scoring five in each - since Zidane replaced sacked Benitez, who only lasted six months. Ronaldo, who scored twice in the 5-1 win over Sporting Gijon, said: "Zidane has been a boost for the team. "Truthfully, with some coaches you have more empathy than others. The players feel more empathy for Zidane." Benitez, who was appointed in the summer, was replaced by Zidane, a club legend as a player, who had been managing the club's B team. Ronaldo added: "I did my job naturally under Benitez. I was serious and did the best for the club, independent of the person who is in charge of the team. "I have never had a bad opinion of Rafa. 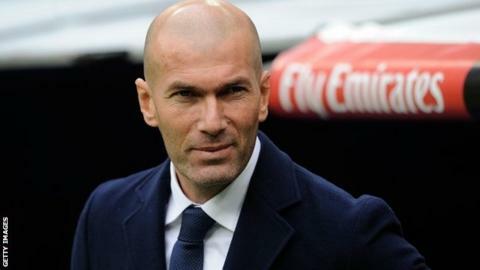 He always did the best for Madrid, but he sees football in a different way from Zizou." Real substitute Jese agreed with Ronaldo: "We did not act behind Benítez's back. I wish him all the best. "Every manager is different, they have their own philosophy, sometimes it goes well and sometimes it doesn't. It didn't with Benítez and now the team is doing better. "I don't like to draw comparisons. Zidane is closer to the players, he knows the players better because he was one, he is a great manager and is going to show that with us. "My relationship with Zizou has been good for the last two years, when he was assistant manager." Real's win over Sporting was not without its problems. Gareth Bale, who scored their opener, came off at half-time with a calf injury. And Karim Benzema, who scored their other two goals, also came off after being accidentally kicked by team-mate James Rodriguez. Zidane said: "Karim's is just a knock but Gareth's injury is a bit more complicated. "It's in the soleus (calf), and in the left one too. It's another problem but we will wait and see what the scans say tomorrow. I hope it is nothing serious."